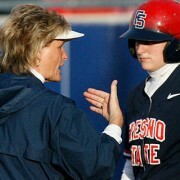 FRESNO, Calif. – Former Fresno State softball coach Margie Wright will receive the Award for Athletics at the 2017 Fresno County Office of Education (FCOE) Honors Gala to be held Saturday night at Fresno City College. Wright is one of four recipients to be honored for their lifetime achievements on Saturday. The NCAA’s all-time winningest softball coach, Wright was the head coach of the Bulldogs for 27 years and led the program to the College World Series 10 times, winning a national championship in 1998. Off the field, she has been a passionate advocate for numerous causes, as well as a highly sought-after softball clinician and motivational speaker. Today, she focuses her efforts on travel softball for young female athletes. Wright will earn one of four honors presented by The Foundation @ FCOE on Saturday. The other recipients include the Award for Academics, Delbert Cederquist; Award for Agriculture, Carol Chandler; and Award for Arts, Yukari Thiesen. The annual gala honors deserving recipients in the Fresno community and raises money for student academic events and programs offered by the Office of the Fresno County Superintendent of Schools. In her 27 years leading the Bulldog softball program, Wright amassed an NCAA-record 1,294-450-1 mark that included one NCAA title (1998), three NCAA runner-up finishes (1988, `89, `90), three NCAA third-place finishes (1991, `92, `97) and three NCAA fifth-place finishes (1987, `94, ’99) among her 10 World College World Series trips with the program. The 10-Time Conference Coach of the Year also racked up 17 conference titles, 26 NCAA Tournament bids (1986-2011) and 178 straight weeks in the NCAA Top 25 en route to NFCA and ASA-USA Softball Hall of Fame distinctions. On the individual front, her Bulldog players included 53 All-Americans, 15 Olympians, 29 Conference Players/Pitchers/Freshmen of the Year and eight professional players. Away from the collegiate spectrum, she was picked as a U.S. head coach for the 1998 ISF World Championship and assistant coach for the 1996 Olympic Games, and helped lead teams to gold medals in each. Fresno State’s home field, formerly known as Bulldog Diamond, was appropriately renamed as Margie Wright Diamond on May 3, 2014 for its pioneering former head coach. “Just the Ticket to Build Our Community” – The Bulldog Scholarship Fund gives Bulldog alumni, fans and friends the opportunity to support Fresno State Athletics and the student-athletes who inspire them. For information about how you can support the Bulldog Scholarship Fund, please visit www.bulldogscholarshipfund.com or call 559-278-7160.